You may have heard this story before or read about it in a history book at school. It was 8:00pm, Sunday, October 30th 1938. The world as we knew it was coming to an end. Years before the rover landed on its surface, strange activities were observed on the planet Mars. Large spurts of gases were being discharged from its surface. Then the unthinkable happe ned. Martians landed near Grove Mill, New Jersey. An unstoppable heat ray was terminating local residents. The first human causality was Carl Phillips, a local news reporter. The United States responded with extreme force. The best bombers in existence were deployed and sent to New Jersey. Unbelievably, all of the bombers were destroyed in the altercation. There was no way to stop the takeover; it appeared as though every person on earth would perish in the horrible take-over. One by one the ruthless Martians overtook the citizens of the New Jersey area. Then it ended as soon as it began. For unknown reasons the Martians started to die. One by one they were all found dead. There was a swift cover-up put in place by the federal government to end the horrible ordeal. Soon the mayhem and uncertainty ended allowing people to slowly forgot the unbelievable mishap. The events told above never happened; although, many people believed they did. The story “The War of the Worlds” rewritten by Howard Koch was broadcast on Sunday October 30th, 1938. It was broadcast over radio and caused nation-wide havoc. Later it was estimated that 6,000,000 people listened to the broadcast and 1,200,000 people believed the event was true. People have an innate trust in the news media. News broadcasters on radio or television and writers of newspaper and magazines articles are very believable. Most of us do not have the time to investigate each newsworthy event in detail, so we have a trust in the story the reporter is telling us. Using multiple sources can make a story more creditable. 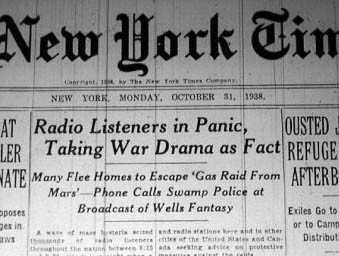 The panic could have been prevented in 1938 if the people would have turned the dial to another radio station. We will always rely on the media to keep us connected to the nation and the world. But we must use sound judgment and follow up on a story of interest before we believe everything we see, read or hear. Through print, monologue and video South Dakotans experience events across town and 1000s of miles away. We experience fantastic events like the release of an endangered species into the wild or when a lost child is found. We also experience horrible events like 911 when Americans were targeted by terrorists or the Tsunami of 2004 that devastated parts of Asia. Unfortunately, staying connected to the world means experiencing the horrible events as well as the happy ones.